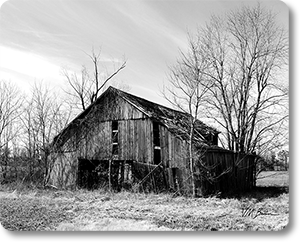 "Fading American History" This classic Tobacco Barn has seen many sticks of tobacco hung and taken down from its old beams for over one hundred years. The sagging roof and the way it leans away from the prevailing west wind are a testament to the weight it has bore during this time. 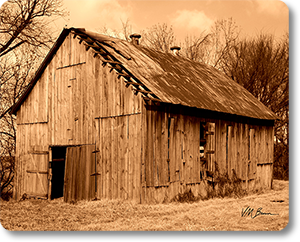 The men who raised and worked this classic barn built this great country with their sweat,blood,and tears and you can feel it in this capture of time gone by. 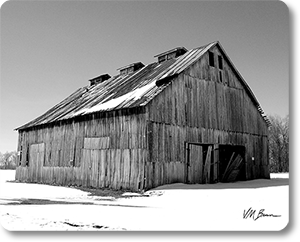 "Lonesome Relic" Standing Tall and Proud in the winter snow this beautiful old barn seems to be trying in vain to defy Father Time. It has survived many hard winters and spring floods here on the river bottom soil. It now stands as a throwback to a better time in the United States of America. 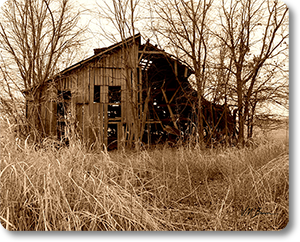 "Lost Relic" The tall grass surrounding this old barn very near to its end softens and comforts the reality that soon this ancient American relic will be a part of the soil. The old wood that has stood for over a century could tell so many tales if it could speak. 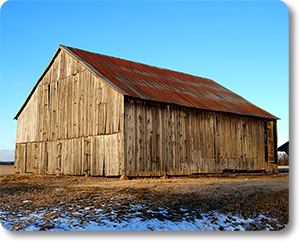 When the wind blows through the grass and the old boards you can almost hear the men talking who built this old barn so many years ago. "Powerful Giant" This strong American Treasure still looks good considering how long it has stood in the Ohio River bottoms. Now with Cornfields around it for miles it looks as if it is standing guard over the land it has ruled for so long. 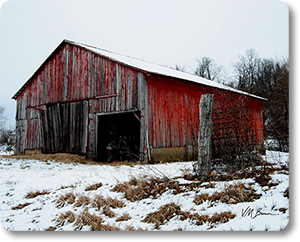 "Rustic Majesty" Classic old livestock barn still looking pretty good in the new fallen snow with the old fence now broken down and rusty. It has housed many cows and horses in its day but in this capture it looks so cold and lonely without them. The peeling red paint is a reminder that this piece of American history is fading into oblivion. "Voice Of The Past" The haunting interior of this old barn in its near death condition cries out for help as the trees grow through it ripping it apart. The hopes and dreams of the farm family that once lived here are now buried deep within the old planks that strain to hold on just a little longer.